Pondicherry is described as an anomaly, the former capital of what was once French India. In terms of storytelling, what makes this town a appropriate choice for Pi”s upbringing? Yann Martel recalls that many Pondicherry residents provided him with stories, but he was most intrigued by this tale because Mr. Adirubasamy said it would make him believe in God. Did Pi”s tale alter your beliefs about God? Yann Martel sprinkles the novel with italicized memories of the "real" Pi Patel and wonders in his author”s note whether fiction is "the selective transforming of reality, the twisting of it to bring out its essence." If this is so, what is the essence of Pi? Pi's full name, Piscine Molitor Patel, was inspired by a Parisian swimming pool that "the gods would have delighted to swim in." The shortened form refers to the ratio of a circle”s circumference divided by its diameter. Explore the significance of Pi's unusual name. One reviewer said the novel contains hints of The Old Man and the Sea, and Pi himself measures his experience in relation to history”s most famous castaways. 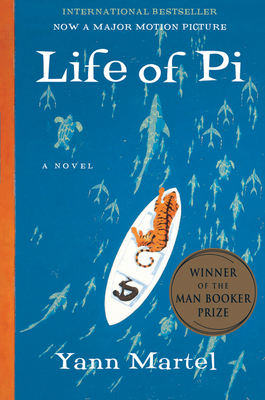 Considering that Pi”s shipwreck is the first to focus on a boy and his tiger, how does Life of Pi compares to other maritime novels and films? In chapter 23, Pi sparks a lively debate when all three of his spiritual advisors try to claim him. At the heart of this confrontation is Pi”s insistence that he cannot accept an exclusively Hindu, Christian, or Muslim faith; he can only be content with all three. What is Pi seeking that can solely be attained by this apparent contradiction? What do you make of Pi”s assertion at the beginning of chapter 16 that we are all "in limbo, without religion, until some figure introduces us to God"? Do you believe that Pi”s piousness was a response to his father”s atheism? Among Yann Martel”s gifts is a rich descriptive palette. Regarding religion, he observes the green elements that represent Islam and the orange tones of Hinduism. What color would Christianity be, according to Pi”s perspective? How do the human beings in your world reflect the animal behavior observed by Pi? What do Pi”s strategies for dealing with Richard Parker teach us about confronting the fearsome creatures in our lives? Nearly everyone experiences a turning point that represents the transition from youth to adulthood, albeit seldom as traumatic as Pi”s. What event marks your coming of age? How do Mr. Patel”s zookeeping abilities compare to his parenting skills? Discuss the scene in which his tries to teach his children a lesson in survival by arranging for them to watch a tiger devour a goat. Did this in any way prepare Pi for the most dangerous experience of his life? Pi imagines that his brother would have teasingly called him Noah. How does Pi”s voyage compare to the biblical story of Noah, who was spared from the flood while God washed away the sinners? Do you agree with Pi”s opinion that a zoo is more like a suburb than a jail? How did you react to Pi”s interview by the Japanese transport ministers? Did you ever believe that Pi”s mother, along with a sailor and a cannibalistic cook, had perhaps been in the lifeboat with him instead of the animals? How does Yann Martel achieve such believability in his surprising plots? The opening scene occurs after Pi”s ordeal has ended. Discussing his work in the first chapter, Pi says that a necktie is a noose, and he mentions some of the things that he misses about India (in spite of his love for Canada). Would you say that this novel has a happy ending? How does the grown-up version of Pi contrast with his little-boy scenes?